At a midday panel held at the California Endowment Conference Center in downtown Oakland, hosted by California Food Policy Advocates, and attended by anti-hunger activists and school food folk, Poppendieck, a sociologist at Hunter College, City University of New York, outlined why there’s no time like the present for reform in the lunch room. And, in case you were wondering, I noshed on a perfectly edible meal of bow-tie pasta with marinara sauce made from scratch, a panini sandwich on sourdough with commodity cheese and school-made pesto, salad bar offerings, and fresh, cut fruit. 1. Convergence of agendas: Concerns about hunger, nutrition, obesity, health, and the environment are merging in the public arena. 2. Conditions of urgency: Obesity among children is on the rise, lifestyle diseases like type 2 diabetes are skyrocketing among the young, yet more kids are going hungry. Concerns about carbon emissions, loss of farm land, and global warming are all going up, up, up. 3. Credibility: The recession gives school lunch renegades street cred. Everyone knows someone who has lost a job. Unemployment increases demand for emergency food services. More people know about so-called food deserts, or lack of healthy food in low-income communities. 4. Consciousness: Awareness of hunger, food insecurity, and the impact of lifestyle choices on what we eat and how it’s produced, is growing. 5. Company: Lots of fellow travelers on the better school food beat are coming together to break bread on this issue. Advocates for school food reform, health and medical associations, even seemingly unlikely allies like the Department of Defense, are joining forces at the cafeteria table. And, of course, the big gun herself FLOTUS, otherwise known as Michelle Obama, is on board. 6. Citizens: Concerned adults are demanding that food improve in the school cafeteria. We’re talking millions of angry moms and dads. 7. Critics: People like Jamie Oliver, who bopped across The Pond to shake up the school lunch menu in West Virginia, and the anonymous teacher blogging at Fed Up With Lunch, who documents the sorry state of food at one Midwestern school every day, are raising awareness and presenting alternatives to what’s on offer now. 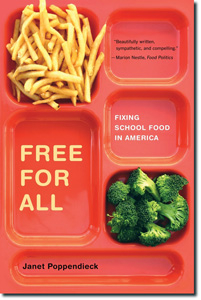 Poppendieck is a proponent, as her book title suggests, for doing away with the current three-tier payment system (free, reduced, and full fare) for school lunch across America. But she’s no starry-eyed idealist. She knows there’s no such thing as a free lunch; her best guess is that a wholly subsidized program would cost the U.S. government an additional $12 billion a year. Depending on your perspective, that’s an awful lot of cash, or a drop in the bucket compared to what the country spends to go to war. To paraphrase Jamie O in a recent Food Revolution episode: “It’s all about the money.” Dominic Machi, director of Child Nutrition Services for Newark Unified, would agree. So would many others. The discussion sparked lots of chatter about the status of school lunch reform in Congress and the nutritional requirements of school food. Some got down to details in snappy fashion. But with all due respect, policy wonks can waffle on about legislative agendas, government data, and nutritional guidelines until your eyes glaze over. The youngest panel member Beebe Sanders, a junior at Berkeley High School, kept things real and fresh. This girl has wisdom beyond her years and gives me hope that maybe we’ll see a national shift in what kids eat at school in my lifetime, as long as we adults don’t mess it up. Beebe Sanders hit the bull’s-eye with the suggestion that nutrition education needs to take place in schools — in the classroom — to change childrens’ attitudes about school food, which can carry a stigma, even with the youngest eaters, as bad food for poor people. 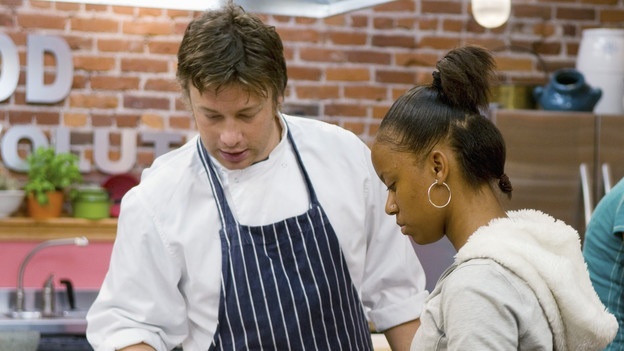 Jamie Oliver long ago figured out you need to get the kids to buy in, as have numerous school food fixers before him. “We need to change the mind-set about how kids feel about school food and why they think it’s uncool to eat it,” says Sanders, who works with Farm Fresh Choice, a local effort to get food to impoverished, hungry people. Do you agree? Is it the money, the mind-set, a combo of the two, or something else entirely that needs addressing before all our kids get to sit down at school with a tray of food that’s nice, nourishing, and doesn’t have nuggets in its name? This entry was posted on April 5, 2010 at 9:40 PM and is filed under food politics, school food. You can follow any responses to this entry through the RSS 2.0 feed. You can leave a response, or trackback from your own site. Agreed. And this is why people have to contact Congress and not accept six cents as an adequate increase of school lunch programs. Thanks! Welcome, Mark, and thanks for weighing in. Interestingly, at the event yesterday, Dominic Machi, the school food services director (himself a trained chef) indicated that he’d use the extra money currently under consideration in Congress to train his staff in back-to-scratch cooking techniques, rapidly becoming a lost art, or so it seems. Great advice…thanks! It is definitely the mind-sets as well as the money. Both the food service companies and parents need to face up to the challenge of demanding fresh food. The former does what it does because it’s a business. Our current provider, Chartwells, is a giant company serving 1000’s of commodity lunches to kids across the country. I think if they themselves don’t step it up it will be that much harder for us to step it up. I’ve spearheaded change in my community and have parents getting angry, school board member reaching out and also the support of progressive mayor who sees the importance of nutrition information in schools! I hope that more parents get angry and repulsed by the processed junk our kids are made to eat. Education=Awareness. Once we have that we can consciously make changes. Welcome, Peta, and kudos to you for getting into the food fight fray in your school community. I wish it were as easy as everyone thinks. School lunches — at least where my mother works in WNY — are all analyzed for nutrition including fat, calories, sodium, fiber and much more. It is also very difficult to put a lunch on for the amount of money that is allowed. People are always complaining about the price of school lunch and how expensive it is but where else can you go to get a hot meal choice for 1.25? And it is not only school lunch that needs to be revamped. How about all the obese kids who have not even started school yet? Maybe parents should include a little more nutrition into there childrens’ lives and not blame everyone else. I am to blame myself although my son is not obese by any means, I do tend to feed him quick meals that are not always as nutritious as they could be. But I also don’t blame others for it. I accept the blame myself. Hello, Michelle, and thanks for offering your opinions. Yes, the USDA certainly doesn’t make it easy for school staff to put a meal on the table. While I understand the need for safety checks and sound nutrition some of the guidelines seem so nit-picky. As I left the panel discussion yesterday I was struck, as I waited in my car, at the sad sight of a very overweight preschooler navigating the crossing with mom. But instead of assigning blame — at home, school, or elsewhere — I think it’s more productive to frame ones thinking in terms of trying to feed our kids good, healthy, local, delicious food as much as we can. Does that make sense? Sarah, Yes this makes great sense. I was not trying to assign blame anywhere. I hope I did not come off that way. It is really sad how many kids are overweight in our society. I grew up in the 70s, when grocery co-ops–at least in the Midwest–were primarily known for fresh-baked bread, some vitamins, bulk foods, and some local produce. My parents became Member #22 of our local co-op, and while I beam with pride about that now, I was embarrassed as a child that my parents insisted on my eating something like whole wheat bread. Now, in 2010–and really, for well over a decade–something happened in the “health food” realm and eating healthy *is* cool among far more people than it was in the 70s. So, while among school kids, fast food might still be a draw, I feel certain that with some savvy marketing help, healthy options at school could become all the rave. Just weeks ago, the Healthy School Meals Act of 2010 was introduced on Capitol Hill. If passed into law, this bill would help improve the National School Lunch Program by providing students with meal options that are high in fiber and low in fat. This sort of food can help prevent excessive weight gain and the chronic diseases that result from overweight and obese conditions. Please visit the Healthy School Lunches campaign site at http://www.HealthySchoolLunches.org. Love that you remember your family co-op membership # from the 70s — must have made quite the impression. And, yes, loads of school food fixers doing their very best to make school food cool food in various communities across the country. Still, savvy marketing, as the panel discussed yesterday, is sorely needed in loads of school cafeterias in many parts of America — once they have some decent food to promote to hungry pupils. All great comments. I also believe we need to get away from the healthier “processed” food options, i.e. the healthier pizza, chicken nuggets and corn dogs. They’re healthier because they’re coated in 51% whole grain breading or use low-fat cheese. There needs to be a revamping of the system so students are taught healthy eating behaviors. This starts in the home, but can be and needs to be reiterated in child care and school meals. We have a long hard road ahead of us, but we will prevail! Hi Nikki, thanks for weighing in. I wonder if you — or other readers — have thoughts about some teaching techniques or tools that might help students embrace healthy eating behaviors. Thanks so much for sending the link. Unfortunately at this time teachers are balking at any additional work and so it’s tough to get them on board to do anything. Believe me, it’s not from lack of trying. Often, it’s not “more work,” but different work. You’re still teaching math, but by doubling recipes or calculating nutritional information for different serving sizes. You’re still teaching social studies, but you’re looking at how the economy changed when people shifted from hunter/gatherer to subsistence agriculture, or from subsistence to commodity, or from one diet to another. You’re still teaching human biology, but you’re placing more emphasis on the effect of various nutrients and chemicals on our health. For the teachers that don’t want to “do work,” you hand them the curriculum and they’ll teach it. For those that think their job is *supposed* to be work, they can have some fun with it! My kids are teens now and way beyond my being able to do a lot about what they eat at school. I was happy to see, though, that they had a day at their high school where all the local restaurants and shops set up tables and the Whole Foods table was one of the most popular. I think kids want to eat healthy, if the healthy choices look tempting, but so often the healthy food is presented in a drab, “have to” sort of way. I agree, M, you can’t underestimate the aesthetics of the plate. I’d have a hard time finding anything served on a tray appetizing. Seems so institutional. That said, how hard is it to make a fruit platter or salad bar — with its rainbow of colors — something you can’t resist eating? I agree that a huge part of this is getting the kids on board. If you serve them healthy food and they collectively decide it’s weird or yucky, no one will eat it. They won’t even try it if the general consensus makes it unpopular. You’re so right M&M, peers are key when it comes to school food. Did you see the last episode of Food Revolution? I loved how Jamie O had the teens hand out tastings of the dish of the day. Reinforces the whole “polite bite” concept and it’s also a way of engaging with students socially around the food, and the social aspect is a big part of eating and shouldn’t be overlooked at school. Yes, the kids definitely have to get on board. And one way adults can make that happen is to stop assuming that children will eat only certain kinds of foods. The only reason kids have gotten in this rut of eating chicken nuggets and pink milk is because that’s what their parents feed them (and what food marketers feed the parents, and what government-subsidized suppliers feed the schools). Instead, let’s start treating our kids with respect and offering them real food and real choices. Like Poppendieck, I, too, feel we’re on the edge of a breakthrough. But there’s still so much work to be done. I love your blog. You might be interested in mine as well. It’s called Spoonfed: Raising kids to think about the food they eat (http://www.spoonfedblog.net). Hi Christina, thanks for the kind words, and welcome to Blogland. Love the look of your blog banner and I can tell the topics you cover will be of interest to me. As for your point about offering kids food other than chicken nuggets & pink milk: Well said! Thanks, Sarah. I appreciate that you checked out the blog. There’s another reason why eating off campus is more appealing than school food. In fact, why eating a bagged lunch, or skipping lunch, or buying chips from the vending machine is more appealing, for that matter. Eating is a social activity for humans. When I was in school, I believe lunch was 35 minutes long. Had I opted to buy my lunch in the cafeteria, it would have meant waiting in line — usually in a crowded, noisy, concrete-and-metal, sheltered outdoor area — for about 10 of those 35 minutes. The line is not set up to foster social activity; in a fast-food restaurant, you can stand next to each other and talk while in line, without railings keeping you in single file. There are a lot of possible ways to address this problem. Making lunch time longer might help. Changing the physical setup of the service area might help. Making things more efficient might help. But if the goal is to get kids to choose school lunches ahead of more convenient and social options, you’ve got to meet them where they are. Welcome Monica, and thanks for articulating a major impediment to kids eating school lunch. I have an elementary age son who eats his home lunch when he gets home at 2:30 — he’s in too much of a hurry to get outside to play to focus on food while at school. And just the other day he mentioned how bummed his buddies were who waited in line for 20 minutes (an eternity at that age) for lunch only to hear that it had run out and they’d need to wait another 10 minutes. What did they do? Ran outside to play, of course. I’m not a mom but I still strongly support school lunch reform. I have five young nieces and nephews who eat at school. They should have access to healthy, wholesome, quality food. Thanks so much for sharing this and making it a topic of discussion! You’re welcome, Jesaka. And kudos to you for being such a concerned auntie. I hope this happens. My kids are out of school, but for all the future kids, it’s so important that they learn – early – not only how to make healthy choices but that they actually have healthy choices offered. Although it will cost a lot to implement, just think of all the health care savings there would be from less obese and more healthy kids. Well said, Sheryl. It’s either money up front for decent food or money later in health care expenses related to dietary diseases. How I hope school lunch reform truly happens! My kids ate school lunch for years in Japan and it was incredibly different. The food culture there as a whole is very different. My children were so struck by that when we came back. They were proud of the fact that they grew vegetables in preschool, kindergarten, and elementary school (they didn’t give snacks in preschool or kindergarten, but occasionally the children would have a chance to eat green beans or other fresh vegetables from the garden), that menus were based on seasonal rhythms, and that food was homemade in a kitchen where they could watch it being made. Dessert was a rarity (and if there was dessert, it was a very small portion and not too sweet); vegetables were plentiful. Now I pack them an Asian lunch every day; their school doesn’t have school lunch, BUT they have encountered more junk food in a few months here than they did in their whole lives… In fact my younger son commented to me, “There’s a lot of American food I didn’t know about…” and then proceeded to list processed after processed name-brand junk food for me. I am sad about that because school has such potential to be a big source for food awareness, and his awareness of US food is that it’s junk food. Christine, thanks for mentioning that NYT article. When I posted it on Facebook, I noted that it stated the obvious. But I’m rethinking that. So many people don’t see anything wrong with this movement toward highly processed, chemicalized food. For them it’s all about convenience and satisfying taste buds (forget that such “food” is far removed from what real food tastes like). And if it’s been approved by the government and is being sold on store shelves, it must be OK, right? Of course we know that’s not true, but it does underscore how entrenched this thinking is. Thanks Christine for adding your cross-cultural comparisons to the mix. I really think/hope the time is right for lunch reform. Awesome post, great discussion.